A remix of a rambling 75-minute speech Gadhafi delivered on Tuesday, set to dance music and featuring the strongman alongside footage of two gyrating girls, has gone viral on the Internet. It has racked up almost half a million views on the video-sharing website YouTube since it was posted three days ago. Called “Zenga Zenga,” the music video mixes Gadhafi’s quotes with club beats, using lines in which he vows to fight “inch by inch, home by home, alley by alley” as the chorus for the song. The clip was created by Israeli musician and DJ Noy Alooshe and appears to be wildly popular in the Arab world despite its origins in the Jewish state. He has also posted online a version of the spoof hit without the scantily clad dancing girls to take into account sensibilities in the Muslim world. That version has some catching up to do in terms of popularity, with about 50,000 hits so far. “There were some curses, but still most said it was a great remix,” Alooshe said. Yesterday we quoted Bernard Lewis on the Arab rebellions and what it is that the Arab people want. (See the post below, Not ready for democracy.) We believe him that they want justice, not democracy or freedom as we understand those two concepts. But we wonder if they want justice as we understand it. He doesn’t say “social justice” – which means the actual injustice of forced redistribution of wealth – but suggests that a return to traditional tribal consultation and arbitration would satisfy them better than the rule of law. We suppose that the sheikhs would be guided by sharia, which is not remotely just, and is extremely cruel. It keeps women subservient, and while Bernard Lewis deplores the condition of women in most Arab and Islamic countries, he does not say how a return to the old tribal system would help their emancipation. They – the Arab masses – want what we have. Sure, they want the products of our civilization, but are not ready for the freedom that makes the invention of those things possible, for the rule of law that makes freedom possible, for the impartial justice that applies the rule of law. Perhaps in time they’ll come to understand this. But to change their ways to our ways, they would have to renounce sharia, throw off the intellectual chains of Islam, and embrace secularism. There are no signs that they will. As might be expected, the best informed and therefore the most valuable opinion on the present upheaval in the Arab states comes from Professor Bernard Lewis, the famous and deservedly much honored historian of Islam and the Middle East. His view is so different from the common opinion and received wisdom recited by media pundits as to be – at least in some instances – surprising. We’ve chosen these extracts from his recent interview with David Horovitz, editor of the Jerusalem Post. The Arab masses certainly want change. And they want improvement. But when you say do they want democracy, that’s a more difficult question to answer. What does “democracy” mean? It’s a word that’s used with very different meanings, even in different parts of the Western world. And it’s a political concept that has no history, no record whatever in the Arab, Islamic world. I think it’s a great mistake to try and think of the Middle East in [Western] terms and that can only lead to disastrous results, as you’ve already seen in various places. They are simply not ready for free and fair elections. In Egypt now, for example, the assumption is that we’re proceeding toward elections in September and that seems to be what the West is inclined to encourage. I would view that with mistrust and apprehension. If there’s a genuinely free election – assuming that such a thing could happen – the religious parties have an immediate advantage. First, they have a network of communication through the preacher and the mosque which no other political tendency can hope to equal. Second, they use familiar language. The language of Western democracy is for the most part newly translated and not intelligible to the great masses. In genuinely fair and free elections, [the Muslim parties] are very likely to win and I think that would be a disaster. A much better course would be a gradual development of democracy, not through general elections, but rather through local self-governing institutions. For that, there is a real tradition in the region. If you look at the history of the Middle East in the Islamic period, and if you look at their own political literature, it is totally against authoritarian or absolutist rule. The word they always insist on is consultation. You have this traditional system of consultation with groups which are not democratic as we use that word in the Western world, but which have a source of authority other than the state – authority which derives from within the group, whether it be the landed gentry or the civil service, or the scribes or whatever. That’s very important. And that form of consultation could be a much better basis for the development of free and civilized government. They’re all agreed that they want to get rid of the present leadership, but I don’t think they’re agreed on what they want in its place. For example, we get very, very different figures as to the probable support for the Muslim Brothers. And it’s very difficult to rely on these things. People don’t tell the truth when they’re being asked questions. One has to understand … the differences in the political discourse. In the Western world, we talk all the time about freedom. In the Islamic world, freedom is not a political term. It’s a legal term: Freedom as opposed to slavery. This was a society in which slavery was an accepted institution existing all over the Muslim world. You were free if you were not a slave. It was entirely a legal and social term, with no political connotation whatsoever. The major contrast is not between freedom and tyranny, between freedom and servitude, but between justice and oppression. Or if you like, between justice and injustice. To say that [the Muslim Brotherhood] is secular [as the US intelligence chief James Clapper did] would show an astonishing ignorance of the English lexicon. I don’t think it is in any sense benign. I think it is a very dangerous, radical Islamic movement. If they obtain power, the consequences would be disastrous for Egypt. I don’t know how one could get the impression that the Muslim Brotherhood is relatively benign unless you mean relatively as compared with the Nazi party. I’m an historian. My business is the past, not the future. But I can imagine a situation in which the Muslim Brotherhood and other organizations of the same kind obtain control of much of the Arab world. It’s not impossible. I wouldn’t say it’s likely, but it’s not unlikely. And if that happens, they would gradually sink back into medieval squalor. Remember that according to their own statistics, the total exports of the entire Arab world other than fossil fuels amount to less than those of Finland, one small European country. Sooner or later the oil age will come to an end. Oil will be either exhausted or superseded as a source of energy and then they have virtually nothing. In that case it’s easy to imagine a situation in which Africa north of the Sahara becomes not unlike Africa south of the Sahara. There’s a common theme [in the Arab states] of anger and resentment. And the anger and resentment are universal and well-grounded. They come from a number of things. First of all, there’s the obvious one – the greater awareness that they have, thanks to modern media and modern communications, of the difference between their situation and the situation in other parts of the world. I mean, being abjectly poor is bad enough. But when everybody else around you is pretty far from abjectly poor, then it becomes pretty intolerable. I was expecting a wave of such movements. I didn’t think it would be as quick and easy as it was in Egypt. But I expect that there will be more. We can see in so many countries, the regimes are already gravely in danger. One method [of supporting the rebels – in Iran, for instance] is by political warfare, by having some sort of propaganda campaign against the regime. This would not be difficult. There’s a vast Iranian population now in the Western world, particularly in the United States, who I’m sure would be willing to help in this, and thanks to modern communications, it would not be too difficult to get the message across. People talk about American imperialism as a danger. That is absolute nonsense. People who talk about American imperialism in the Middle East either know nothing about America or know nothing about imperialism. … As applied to American policy in the Middle East at the present time, it is wrong to the point of absurdity. There are increasing numbers of people in the Arab world who look with wonderment at what they see in Israel, at the functioning of a free and open society. I read an article quite recently by a Palestinian Arab whom I will not endanger by naming, in which he said that “as things stand in the world at the present time, the best hope that an Arab has for his future is as a second class citizen of a Jewish state.” A rather extraordinary statement coming from an Arab spokesman. But if you think about it, he’s not far wrong. The alternative, being in an Arab state, is very much worse. They certainly do better as second class citizens of the Jewish state. There’s a growing realization of that. People would speak much more openly about that if it were safe to do so, which it obviously isn’t. There are two things which I think are helpful towards a better understanding between the Arabs and Israel. One of them is .. the perception of a greater danger. … Sadat turned to Israel because he saw that Egypt was becoming a Russian colony. The same thing has happened again on a number of occasions. Now they see Israel as a barrier against the Iranian threat. One sees similar calculations later than that. Consider for example, the battle between the Israeli forces and Hezbollah in 2006. It was quite clear that the Arab governments were quietly cheering the Israelis and hoping that they would finish the job and were very disappointed when they failed to finish the job. The best way of attaining friendship is by confronting a yet more dangerous enemy. There have been several such [enemies] in the Middle East and there are several at the present time. That seems to me the best hope of understanding between the Arabs on the one hand and either the West or the Israelis on the other hand. The other one, which is less easy to define but in the long run is probably more important, is [regarding Israel] as a model of democratic government. A model of a free and open society with rights for women – an increasingly important point, especially in the perception of women. It goes further than that. A child who grows up in a traditional Muslim household is accustomed to authoritarian, autocratic rule from the start. I think the position of women is of crucial importance. That is why I am looking with great interest at Tunisia. Tunisia is the one Arab country that has really done something about women. In Tunisia there is compulsory education for girls, from primary school, right through. In Tunisia, women are to be found in the professions. There are doctors, lawyers, journalists, politicians and so on. Women play a significant part in public life in Tunisia. I think that is going to have an enormous impact. It’s already having this in Tunisia and you can see that in various ways. But this will certainly spread to other parts of the [Islamic] world. A fuller record of the interview may be found here. Government employees … work for democratically elected officials representing the will of the people. This is just one reason why there is no legitimate role for government unions, and there should be no collective bargaining rights for public servants. Government unions themselves can choose who negotiates with them on behalf of the people, through their votes and political support. In return for lavish pay and benefits far exceeding private compensation, the unions provide a kickback in campaign contributions and muscle to their political benefactors, financed by the taxpayers. This inherent conflict of interest involved in government unions leads to oppressive political corruption, where there is no political limit as well as no market limit to the plunder of the public by government unions. Ferrara approves of the bill that Wisconsin’s Governor Walker is trying to pass. It would, he writes, “greatly benefit state and local workers by terminating government collection and payment of their union dues”, because “this gives power to each worker to voluntarily decide if they want to pay those dues.” And this is a policy, he urges, that “needs to be adopted in every state, as taxpayer money going to government union dues is the root of political corruption in America”. We ourselves, being theoreticians only, can be far more radical in our prescriptions. We would like to see government unions banned, and the withering away of all others. You’ve probably seen this video – it’s being watched all over the United States. This video shows the shocking level to which union bosses influence the Obama administration’s policies. AFL-CIO head Richard Trumka … states he has been in touch with the White House everyday and is present at meetings inside the White House several times a week. On the other hand, at least half-a-dozen members of his own Cabinet say Obama has never spoken with them in the two years of his administration to date. … Trumka, who has worked with European socialists for a global tax, is one of a chosen few radicals pulling the strings. So much for the assurances of psuedo-conservatives, who enthused at how “conservative” Obama’s cabinet was, especially his foreign policy choices. Wiser heads knew Obama was committed to imposing socialism at all costs. This video proves the “moderate” left-wingers in his administration are window dressing for a far more sinister agenda, one about which many so-called conservatives are utterly clueless. By granting government workers the power to collectively bargain, government unions have completely politicized the civil service. State and local employees in 28 states are required to pay full union dues or get fired. Using this government coercion, government unions have amassed tremendous financial resources that they use to campaign for higher taxes and higher pay for government workers. The top outside spender in the last election was the American Federation of State and County Municipal Employees ($91 million). The case against trade unions for government employees was clear even to President Franklin Delano Roosevelt. But what is the case for any trade unions to exist? If full employment is desirable, if the consumer’s interests are paramount so that prices should be kept as low as possible, how do trade unions help? Do they make employers more or less keen to take on employees? Do they have the effect of lowering or raising the price of goods to the consumer? Every trade union member is a consumer. What good are higher wages arrived at through collective bargaining if the increase is consumed by higher prices? We are not persuaded that trade unions are good for anyone (except of course would-be Stalins like Trumka). Our Yukkie Award for the Most Personally Repulsive Tyrant in modern times goes, in a line-up of stiff competition, to Colonel Gaddafi of Libya. Maybe only just in time. His tyrant status is slipping. He’s no longer supremo over the whole of his bleak desert country. About a third to a half of the six-or-so million miserable people whose faces he’s been grinding in the dust for decades are in full rebellion, and the blood of hundreds of them is soaking the sand as his still-obedient goons mow them down on land, from the air, and from the sea. Cyrenaican protesters … who control half of the country and part of its oil resources, embarked Sunday, Feb. 20, on a full-scale revolt against Muammar Qaddafi and his affluent ruling Tripolitanian-dominated regime. Cyrenaica is in the east of the country. There the coastal towns of Benghazi and Tobruk are in the hands of the rebels. Since last week, heavy battles have been fought in Benghazi, Al Bayda, Al Marj, Tobruk and at least two other two cities. In some places … protesters stormed army bases and seized large quantities of missiles, mortars, heavy machine guns and armored vehicles – and used them. The important Fadil Ben Omar Brigade command base in Benghazi was burnt to the ground. High officials of his regime and businessmen began fleeing Tripoli aboard Libyan Air Force fighter jets and helicopters which landed Monday at Malta’s MIA international airport. Government officials in Valetta said the pilots had defected rather than bomb demonstrators, while all the Libyan arrivals asked for political asylum and more flights were on the way. The 22,000-man strong Libyan Air Force with its 13 bases is Muammar Qaddafi’s mainstay for survival against massive popular and international dissent… 44 air transports and a like number of helicopters swiftly lifted loyal tribal militiamen fully armed from the Sahara and dropped them in the streets of Tripoli Monday, Feb. 21. Qaddafi had mustered them to fill the gaps left by defecting army units and the large tribal militia which went over to the people. 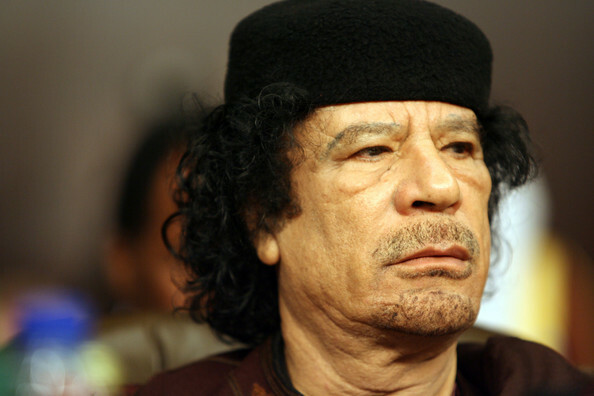 One of the ruler’s sons, Mutassim Qaddafi, is in command of the Tripoli crackdown. Air Force planes, mostly from the Libyan Air Force’s inventory of 226 trainers, and helicopter gunships, bombed and fired heavy machine guns to scatter every attempt to stage a rally in the city’s districts. In their wake, Mutassim’s “Libyan Popular Army” cleared the streets of protesters. The tactics employed by Qaddafi and his sons was, first, to give the protesters free rein to rampage through the city, torch state TV and government buildings and so generate an impression among them and in the West that the Qaddafis were about to fall. But when the demonstrators fanned out to seize the rest of the capital, they were bombed from the air and targeted by the tribal militias, who had no qualms about shooting directly at civilian crowds. His strategy for staying in power rests first on consolidating his grip on Tripoli and then using it as a base for military operations to regain control of the rest of the country, including Cyrenaica . … Libyan Navy missile ships began pounding Benghazi from the sea. Straight after [Gaddafi’s] speech, Tripoli announced that Libyan oil and gas exports were blocked to Europe, causing pandemonium in a world market that saw a 12 percent price hike of crude oil this week and seriously threatens the fragile economies of many nations. There has been an earthquake in New Zealand which has killed at least tens and possibly hundreds of people. We haven’t seen or heard much about it on the usual news channels, but Mark Steyn has commented on it. I woke up this morning to photographs of a steeple-less Christchurch Cathedral – a jolting image to those of us with friends and colleagues on the other side of the world … As I write, the estimate of the death toll is between 65 and 200 people, which sounds low by the standards of global catastrophe but is devastating in a country with New Zealand’s population: It would be the equivalent of 5,000 to 15,000 Americans being killed in Hurricane Katrina. … SteynOnline has a lot of Kiwi readers, and our prayers are with you today. Why, in his understanding, does the being he worships need to be prayed to about the disaster? Is he not supposed to be all-knowing , all-powerful, and all-loving? Yet was not aware that an earthquake had happened in NZ until informed through prayers? Or is it that the almighty being would not aid surviving victims until asked in prayers? Has to be begged, implored? And such a being as this is to be loved and worshiped? Feared, okay: if author of everything, then author of the earthquake, the suffering, and the deaths. It’s plain that our forefathers invented an evil deity in this “Almighty God” – but it’s also plainly impossible to invent a good one.